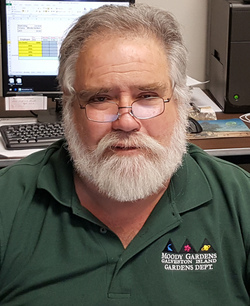 Moody Gardens Director Danny Carson will be the guest speaker for the Stephen F. Austin State University SFA Gardens' monthly Theresa and Les Reeves Lecture Series, slated for 7 p.m. June 14 in the Brundrett Conservation Education Building at the Pineywoods Native Plant Center. NACOGDOCHES, Texas - Stephen F. Austin State University's SFA Gardens will host the monthly Theresa and Les Reeves Lecture Series at 7 p.m. June 14 in the Brundrett Conservation Education Building at the Pineywoods Native Plant Center, located at 2900 Raguet St. Danny Carson, director of gardens at Moody Gardens in Galveston, will present "Behind the Scenes at Moody Gardens: Why 1,100 Employees is Never Enough." Carson, a Houston native and International Oleander Society board member, began working at Moody Gardens in 1986 as an assistant horticulturist. He is responsible for 142 acres of grounds and wetlands, including all the landscape, irrigation, hardscape, Rainforest Pyramid, interior plants, green houses, gardening programs and events, horticulture therapy, and special projects. Carson said his primary goal is to make Moody Gardens the best it can be.